I was invited to the film premier of “The Man Who Knew Infinity” based on the true life story of Srinivasa Ramanujan. Ramanujan, born in Madras India 22nd December 1887, was arguably, one of the greatest mathematicians to come out of the 20th Century. I familiarised myself with a number of texts, prior to watching the film. I anticipated that film makers would possibly, not portray him in his true likeness. However, I was pleasantly surprised, with the adaptation of the story by Warner Brothers. The film begins in earnest in 1913, with Ramanujan sending a letter to Godfrey Hardy, a pure mathematician, stating that he had found a solution to the Prime Number Theorem . Upon recognising that Ramanujan was some one of great potential, Hardy invited Ramanujan to travel from India, to work alongside him at Cambridge University. Despite religious misgivings, that he would be cursed for crossing the sea, leaving his young wife and family behind; Ramanujan travelled to England in 1914, desperate for his work to be published. The film demonstrates Ramanujan struggles to settle in Cambridge, both culturally and academically. His wellbeing gradually deteriorated as he neglected his health in a quest to have his work recognized by leading experts. Ramanujan and Hardy clash over their differing mathematical approaches. Ramanujan at the time relied on intuition whilst Hardy insisted that the proof should rule supreme. Ramanujan and Hardy also disagreed over religion, Hardy was an atheist whilst Ramanujan was highly religious. Ramanujan, nevertheless looked to Hardy for emotional support but Hardy was very reserved. The film also revealed that Ramanujan unfortunately suffered racism. A scene that I could relate to as a BAME mathematician, was when one of the Cambridge professors tried to belittle Ramanujan by stating “you don’t belong here” Conversely Ramanujan was able to answer a complex problem posed to him that proved he had as much right as his critics to be at the university. Certainly in my formative years I could remember being told those very words. Despite their differences, Ramanujan and Hardy they had one thing in common, their passion for mathematics. Hardy recognized this by agreeing with his closest collaborator, mathematician John Littlewood that “Every positive integer is one of Ramanujan’s personal friends.” Together they developed the theory of partitions . Despite opposition from his colleagues, in 1918 Hardy battled to make Ramanujan both a Fellow of the Royal Society and Trinity College. Still, despite his mathematical achievements, depression and ill health led Ramanujan to attempt suicide; fortunately he was unsuccessful. Eventually a mutual decision was made, that due to health concerns, Ramanujan needed to return to India. What was truly amazing about Ramanujan, was that he accomplished extraordinary heights in mathematics, during the early 20th century. This was before he came into contact with the British educational system. As stated in the New York Times  a genius can arise from anywhere. The director focused on Ramanujan’s relationship with the highly acclaimed mathematician, Hardy. The film recognised that Ramanujan was a mathematical genius, who was not devoid of deep emotions. Consequently, because of the great sacrifice he made, this unfortunately led to his premature death, at the tender age of 32. I found the film engaging and a moving experience. 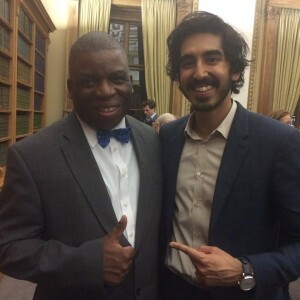 Dev Patel (Ramanujan), the leading protagonist, represented the character, as a believable mathematical genius, struggling in an alien environment. I score the film 1729 out of 1729! Dr Chamberlain with the actor Dev Patel (Ramanujan).